The words of Nehemiah son of Hacaliah. In the month of Chislev, in the twentieth year, while I was in Susa the capital, one of my brothers, Hanani, came with certain men from Judah; and I asked them about the Jews that survived, those who had escaped the captivity, and about Jerusalem. They replied, “The survivors there in the province who escaped captivity are in great trouble and shame; the wall of Jerusalem is broken down, and its gates have been destroyed by fire.” When I heard these words I sat down and wept, and mourned for days, fasting and praying before the God of heaven. I said, “O Lord God of heaven, the great and awesome God who keeps covenant and steadfast love with those who love him and keep his commandments; let your ear be attentive and your eyes open to hear the prayer of your servant that I now pray before you day and night for your servants, the people of Israel, confessing the sins of the people of Israel, which we have sinned against you. Both I and my family have sinned. We have offended you deeply, failing to keep the commandments, the statutes, and the ordinances that you commanded your servant Moses. Remember the word that you commanded your servant Moses, ‘If you are unfaithful, I will scatter you among the peoples; but if you return to me and keep my commandments and do them, though your outcasts are under the farthest skies, I will gather them from there and bring them to the place at which I have chosen to establish my name.’ They are your servants and your people, whom you redeemed by your great power and your strong hand. O Lord, let your ear be attentive to the prayer of your servant, and to the prayer of your servants who delight in revering your name. Give success to your servant today, and grant him mercy in the sight of this man!” At the time, I was cupbearer to the king. Comments – Nehemiah hears a report about the Jews who escaped captivity and are still in Jerusalem. They’re in bad shape, as is the wall surrounding their city. Nehemiah says he was a cupbearer to the King.” That would have been the King of Persia. Now, a “cupbearer” was not a great job! He had to taste the food & drinks that were prepared for the king to make sure there was not poison in them. In turbulent times this was not a job with a lot of longevity! heart.” Then I was very much afraid. I said to the king, “May the king live forever! Why should my face not be sad, when the city, the place of my ancestors’ graves, lies waste, and its gates have been destroyed by fire?” Then the king said to me, “What do you request?” So I prayed to the God of heaven. Then I said to the king, “If it pleases the king, and if your servant has found favor with you, I ask that you send me to Judah, to the city of my ancestors’ graves, so that I may rebuild it.” The king said to me (the queen also was sitting beside him), “How long will you be gone, and when will you return?” So it pleased the king to send me, and I set him a date. I’d like to talk to you for a few minutes this morning about prayer. When I announce that I’m going to preach on prayer, I’ll bet a number of you instantly feel guilty. “I know I don’t pray enough, Preacher. Slap my hand again. I can take it. 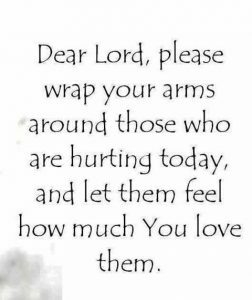 I deserve it.” Many of us feel bad about our prayer lives. We feel we don’t often enough, long enough or well enough, as if there were one correct way to pray. And we seem to have the impression, consciously or unconsciously, that prayer has to be lengthy and intense to really be genuine. You have to work at it! In many circles “Sweet Hour of Prayer” is a very beloved hymn. I know I love it, but I wonder the percentage of folks who’ve ever spent a solid hour straight in prayer. That’s hard to do! In the 40+ years that I’ve been a practicing Christian I’ve only done it three times, and all three were in a group setting with a leader who lead us through various types of prayer, including singing. But left alone I could never do it. So, if you have trouble sitting still for a Sweet Hour of Prayer, and if you would like to feel less guilty about your prayer life and at the same time pray more often, then I have good news for you – our prayers do not have to long, wordy and eloquent to count! Our prayers do not need to sound like they should automatically be printed in the Anglican Book of Common Prayer! I love that book, but I can’t pray that way off to top of my head. And I don’t think God expects me to, otherwise God would have made me much smarter! When it comes to prayer, the Bible offers us a great example in the person of Nehemiah. In the book that bears his name, Nehemiah turns to God in prayer six times. And none of his prayers are very long. The first prayer is found in chapter 1. It lasts for 7 verses. It just took me 1 min. 35 seconds to read it. (Yes, I know it’s a little weird to time your prayers, but I don’t make fun of your quirky habits!). One minute and 35 seconds. If I told you I just had a beautiful time with God. It lasted one minute and 35 seconds, would you say to me, “Wow! You are a Spirit Giant, Pastor Rich. You’re a mighty, modern mystic!” Of course not. 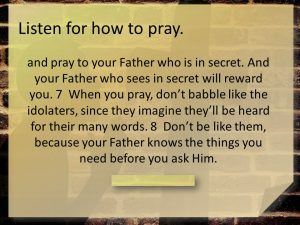 Somewhere we’ve gotten into our heads that prayer has to be a long, arduous task to be heard by God. But prayer doesn’t have to be long to be effective and intimate. 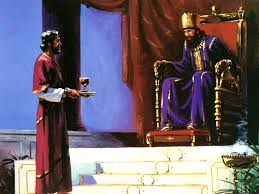 Now think about that for a minute – Nehemiah is in the midst of a conversation as he serves to king. 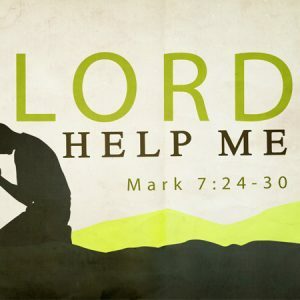 The king offers to help him, but before Nehemiah responds to him, Nehemiah wants to ask for God’s help. A lot was riding on this request. “Then I prayed to the Lord and I said to the king.” I don’t think that Nehemiah stopped and bowed his head and prayed a fancy prayer – “O Lord, thou giver of every perfect gift, whose ways are unsearchable and whose wisdom is from everlasting to everlasting;. I do beseech thee according to thy exceeding grace to grant me verbal wisdom for this present moment.” No. I think Nehemiah simply said to God, “Help me with this answer.” And God did. 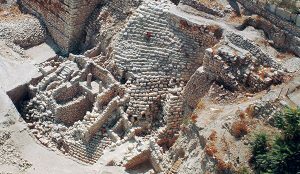 In chapter 6, Nehemiah is now back in Jerusalem and he’s rebuilding the wall. 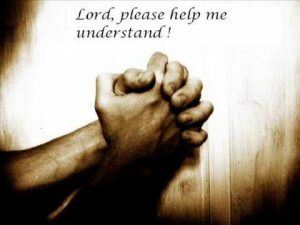 They’re running into some problems and so Nehemiah prays, “Lord, strengthen my hands.” And God did and part of that wall is still standing in Jerusalem. 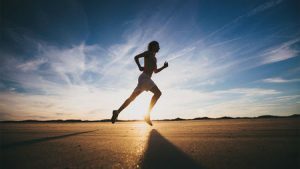 Some people call these kinds of prayer, “Flash Prayers” or “Short prayers.” I call it “Prayer on the Run.” Now if I taught this without showing you that it comes from the Bible you’d be tempted to think I’m watering down spirituality. “Spirituality Light – Taste great. Less filling.” But we’ve seen that this practice goes as far back as Nehemiah and was truly taught by Christ himself. So, try some short prayers this week. 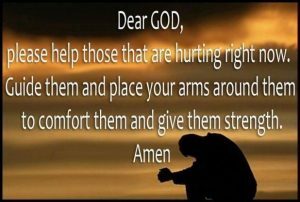 When you look around you, when you walk down the hall in school and you see someone going through a rough time just offer a one sentence prayer for them. These prayers are not fancy but they’re heard! John Calvin, the Protestant Reformer, believed that the best way to stay in touch with God was to say grace before every meal and pray short prayers throughout the day. So why not give it a try? My guess is you already have. You just didn’t know that such giants as Calvin, Nehemiah and Jesus fully endorsed it and encouraged it! Loving God, thank you for this clear message in scripture. Help us to practice these prayers this week that we might walk close to you every day. In your name. Amen.